Are you looking to fundraise for your projects? Are you a not-for-profit diaspora organisation registered in the UK? Are you delivering projects in Africa? Join successful fundraisers such as Charles Kazibwe, who raised £20,287 for his Safe Clean Water project in Uganda! AFFORD has partnered with GlobalGiving, a leading global crowdfunding platform, to enable African diaspora organisations based in the UK to fundraise for their activities in Africa. We are inviting African diaspora organisations across the UK to mobilise their supporters to raise at least £5000 each for your community development or social enterprise projects in your countries of interest or heritage. Our Diaspora Accelerator Crowdfunding Campaign will supplement the figure you raise by an additional 25% in Gift Aid and the 3 most successful campaigns will receive a bonus prize in addition to the amount they fundraised for. Why join this crowdfunding campaign? Fundraise alongside other diaspora organisations and tap into AFFORD and GlobalGiving networks in addition to your own. 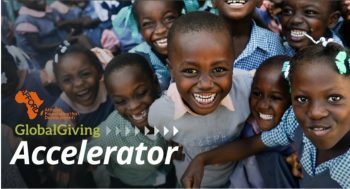 Join our second introductory webinar on Wednesday 29 November from 03:30 pm to 05:30 pm to find out more about the AFFORD-GlobalGiving Crowdfunding Accelerator campaign. Email adf@afford-uk.org to register your interest.